I was fortunate in that I did not retire suddenly, therefore unprepared. Even before my last full five years of employment, I had survived doing contract work for public art galleries and museums in Western Canada. I even did a bit of teaching, which was a learning experience. It probably enriched me more than my students. 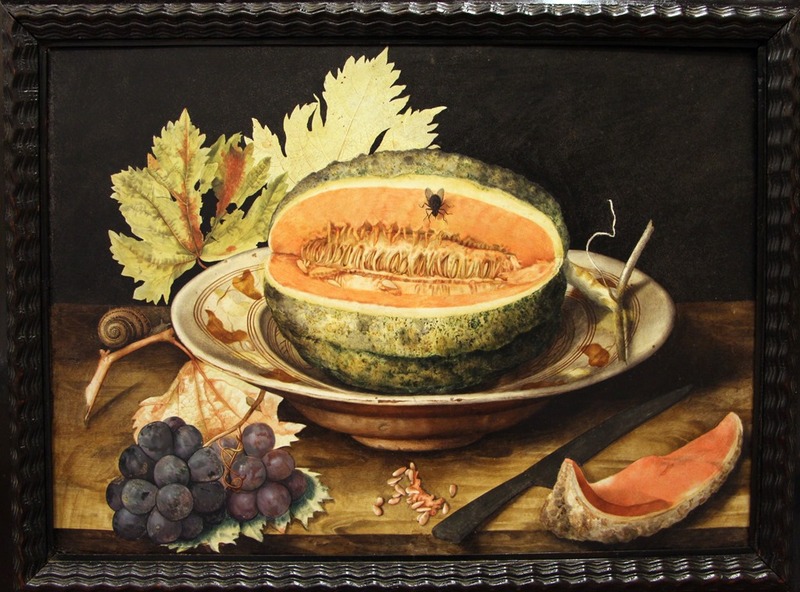 Throughout my life, the arts have nourished me, most especially the visual arts, classical music, and the culinary arts. Nature and its proximity have always been important. I have sought its solace and am blessed in that I live in a beautiful valley, with orchards and vineyards. amidst ancient mountains. I have also been blessed with an appreciation of good food, thanks to my parents and perhaps to my French Canadian heritage. My sympathetic partner of many years, Merv, has shared this particular interest, to our mutual delight. All these things are the stuff of daily life to me… and bring me peace and tranquility. Can’t sleep? Worried that you’ll miss the rainbow goddess, Iris, when she appears in the morning or maybe appear a bit more dishevelled than Morpheus in Guérin’s painting? Music can help you sleep. It is a time-honoured tradition. Musicians performed nearby when Louis XIV decided to go to bed at night. Marin Marais composed some Trios for the Sung King’s bedchamber. In our marvellous digital age, you too can have a virtual Johann Goldberg playing these variations on, say, your bedside Amazon Echo device. In fact, you can use your musical time machine to conjure up a host of other musicians from different periods to add to Mr Goldberg’s musical entourage. So the question is, what constitutes a viable playlist for the insomniac? The objective is to somehow induce rest, if not sleep. The Goldberg Variations are familiar to most people who like classical music. There are many, many recorded versions of the work! Some are more exciting than others. I am not sure that listening to the two extraordinary recordings (1955 and 1981) of the work by Glenn Gould would be that relaxing. In fact, they make for pretty exciting listening. My preference for the purpose at hand is a version played on the harpsichord, the quieter the better. For this purpose, volume control comes in handy. 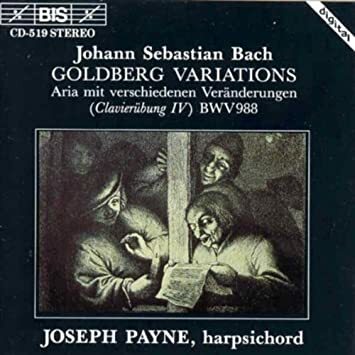 My preference is Joseph Payne’s 1991 recording on BIS CD-519. 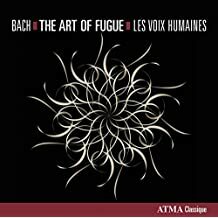 Staying with Bach for a moment, my next choice would be a recording of his Art of the Fugue (BWV 1080). Bach did not specify the instrumentation for this unfinished work, so many resourceful performers have come up with their own approaches. The Art of the Fugue is essentially an exercise in counterpoint. Like the Goldberg Variations, the various canons and fugues can sound rather mathematical. My choice is a bit idiosyncratic, keeping in mind the context of insomnia. It is the version performed by the Canadian group Les Voix Humaines, a consort of viols, in this case, four of them. (ATMA Classique (ACD2-2645). If you are used to a more direct and literal interpretation of the score, this will come as a surprise. The historical context of viol playing (French and British) is brought to bear on the performance, with lots of ornamentation, so that the score is used more as a roadmap than a score, and there is a sense of archaic improvisation, but the key is the sound produced. It is one of my favourite recordings to play on my Amazon Echo device in the middle of the night. There is something mesmerizing about the sound of a consort of viols, even a mere pair of viols, and fortunately, there is quite a large repertoire of music for two or more viols. 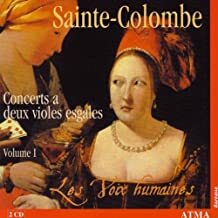 Staying with Les Voix Humaines, they have recorded the complete works of Jean de Sainte-Colombe for 2 bass viols on no less than 8 CDs. It is extraordinary stuff. The music of Sainte-Colombe was introduced to a wide public in the 1991 film Tous les Matins du Monde. Any of these albums could be used in the insomniac’s playlist. And they have recorded a lot more viol music. For English viol music, Henry Purcell’s Fantasias for viols are quite extraordinary. A contemporary relative of the viola da gamba was the baryton. Because Prince Nicholas Esterhazy happened to play this instrument, his resident composer, Joseph Haydn had to compose music for the Prince and his instrument. As a result, there are over a hundred trios for baryton, viola and cello. These are very mellow instruments, and the baryton trios are remarkable. Fortunately, there has been a bit of a revival of interest in the baryton as a result of the contemporary predilection for music played on original (or authentic) instruments. In 2009, one ensemble even recorded everything that Haydn wrote for the instrument, and as I am a great fan of Haydn, I bought the entire set. Some say it is boring music, but I love it. The entire set is available on Spotify Premium, the best service if you love classical music and a tremendous resource for compiling a customized playlist for the insomniac. (For Classical music, Amazon Prime Music is useless!) 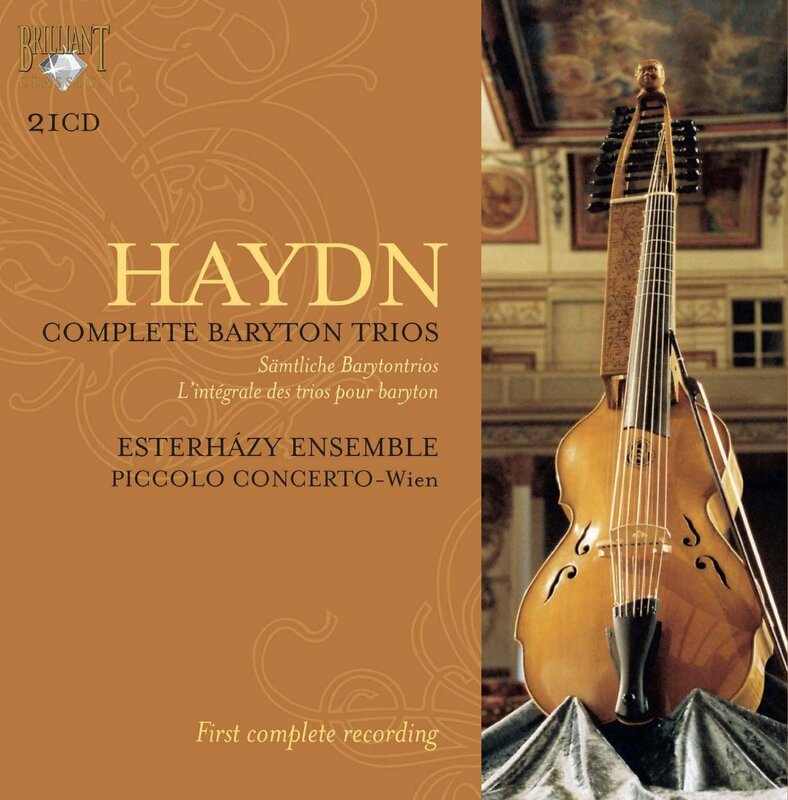 Haydn’s baryton trios suit the bedside playlist really well. There are examples of Baryton Trios by Hadyn on YouTube, where you can see and hear this rare and resonant instrument. In the same period that Haydn composed his music, during his short life Mozart also wrote some night music, but his brilliant Eine Kleine Nachtmusic, K. 525 (1787) is a little too energetic for our purposes. For something a bit more suitable, his music for Basset Horns will do admirably. I am fortunate enough to have a 1986 recording of such music played by the Cleveland Symphony Winds (CBS Masterworks M2K42144). 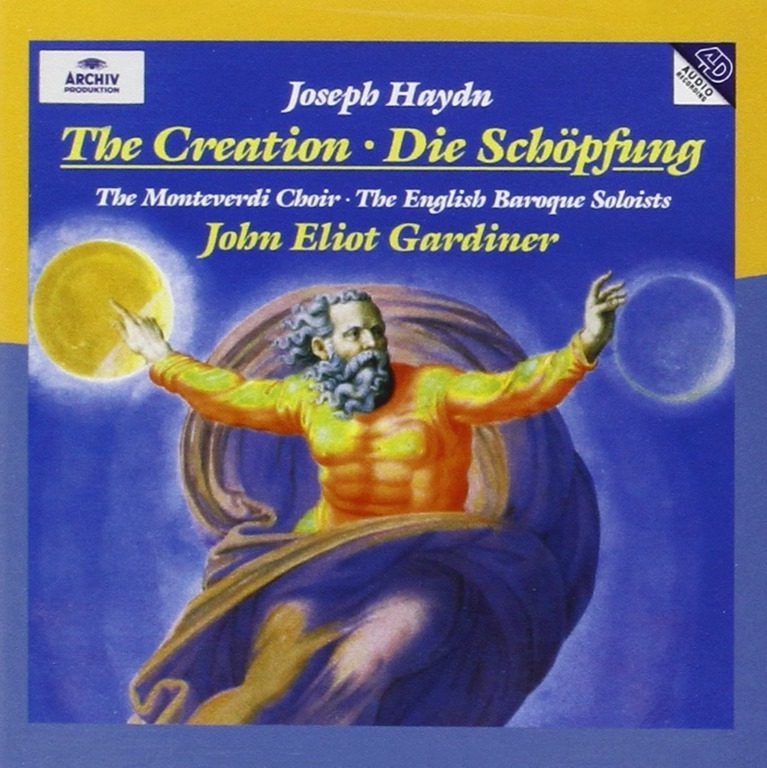 What is particularly marvellous about this recording is that the various notturnos and divertimentos are arranged in programs where the notturnos (sung by male or female voices with basset horn accompaniment) alternate with the instrumental divertimentos, usually scored for three basset horns. While I don’t advise vocal music to put you to sleep, lullabies notwithstanding, this would at least relax you. There are a few other Notturnos by Mozart, but they are actually quite boisterous affairs, suitable for a very civilized evening garden party. Then there is Schubert, whose exquisite melodies will provide rest and delight. None more so than his Notturno in E flat major (D.897). Several wonderful versions of this. My favourite is one performed by the Gryphon Trio in their Analekta compilation of Great Piano Trios by Beethoven, Mozart, Schubert and Shostakovich. There is a fairly loud middle section but quiet prevails in the end. 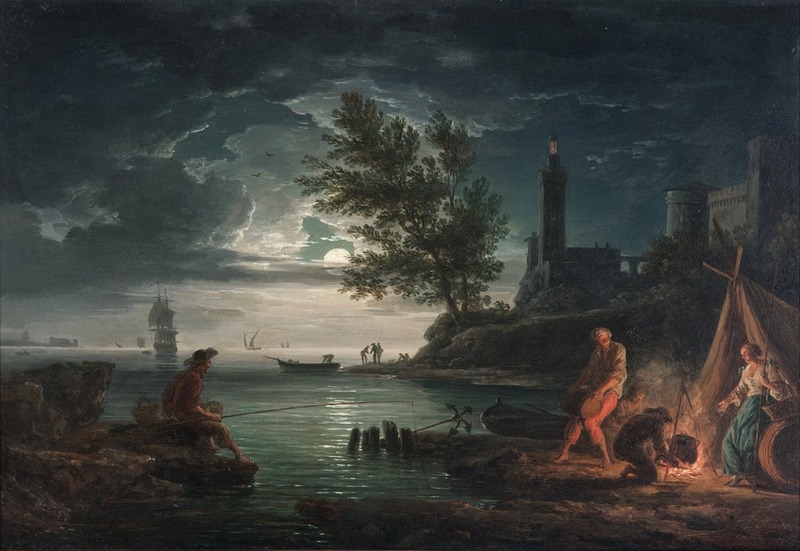 It seems natural to link insomnia with nighttime, and in a musical context, it is the Nocturne (Notturno) that first comes to mind when thinking of night music. As a rule, a nocturne will be quiet and slow. The Romantic period provided music lovers with splendid nocturnes, of which 16 were composed by the Irish musician John Field between 1812 and 1836. Well known as a performer in his time, Field seems to have originated the Nocturne as a composition for solo piano. Field’s Nocturnes were much admired by his more famous contemporary, the Polish musician Frédéric Chopin, who would write 21 Nocturnes between 1827 and 1846. Both Field’s and Chopin’s Nocturnes are perfect music for the insomniac. 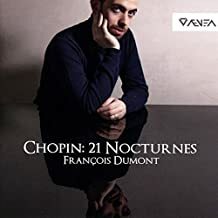 Lots of recordings of the Chopin Nocturnes. I have had Daniel Barenboim’s interpretations for years, but have found much delight in a recent recording found on Spotify by François Dumont. It has soothed me to sleep many times, before the 1 hour and 43 minutes have played through. Maybe just reading this soporific text has already put you to sleep, but there are a couple of more contemporary works I have to mention. 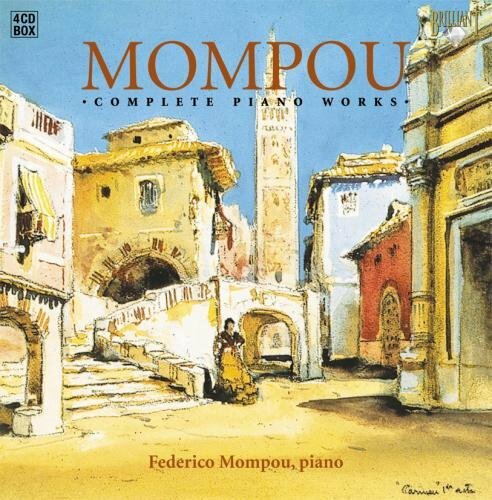 A number of years ago, I became intrigued by Federico Mompou’s Musica Callada. (1959-67) I had never heard of this Catalan composer before, let alone this extraordinary music. The very idea of “silent music,” was challenging, so I purchased his complete piano works performed by the composer himself. Not being a musicologist, I can’t quite describe the Muisca Callada adequately, except that it is strangely riveting, very quiet music, hypnotic in effect. Lately, I have been playing a wonderfully sensitive performance, again found on Spotify, by Emili Brugalla. 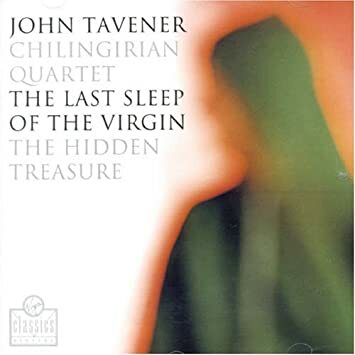 Another piece of extraordinary contemporary music is John Tavener’s, The Last Sleep of the Virgin (1991). It was composed on the eve of the composer’s major heart surgery. He specified that the players were to perform the piece “at the threshold of audibility.” It is scored for string quartet and handbells, and the effect conveys a trance-inducing sound. (The companion piece on this particular recording, The Hidden Treasure, is not conducive to sleep). 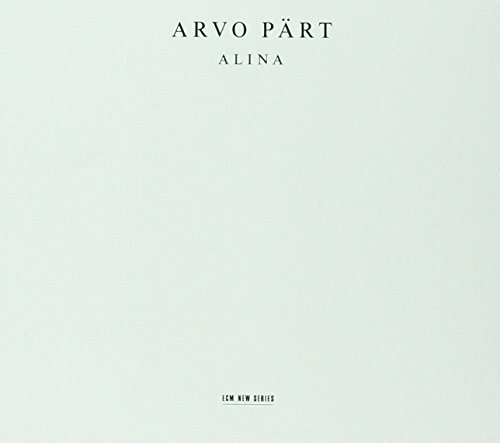 Arvo Pärt is apparently the most performed contemporary composer in the world today. Born in Estonia, his music evolved into something simple and extraordinary. I first heard his music more than a decade ago. Then a friend lent me his newly-purchased copy of Spiegel am Spiegel and Alina. I immediately bought the CD even before returning my borrowed copy. The work has been recorded many times, but this particular recording is the treasure. And it has lulled me to blissful sleep more often than any other music. It is still the Pärt CD I play most often, and I have several, even some earlier works recorded on BIS. All of these recordings are my current choices to induce sleep. In another time, I am sure I would have chosen others. There would have been more orchestral music in all probability. Probably much Gregorian chant which I have always loved. But given current technology and resources (Amazon Echo, Spotify Premium), these recordings are on my present list, enough to keep you in your bed at night, and enough to bring you into the arms of Morpheus. 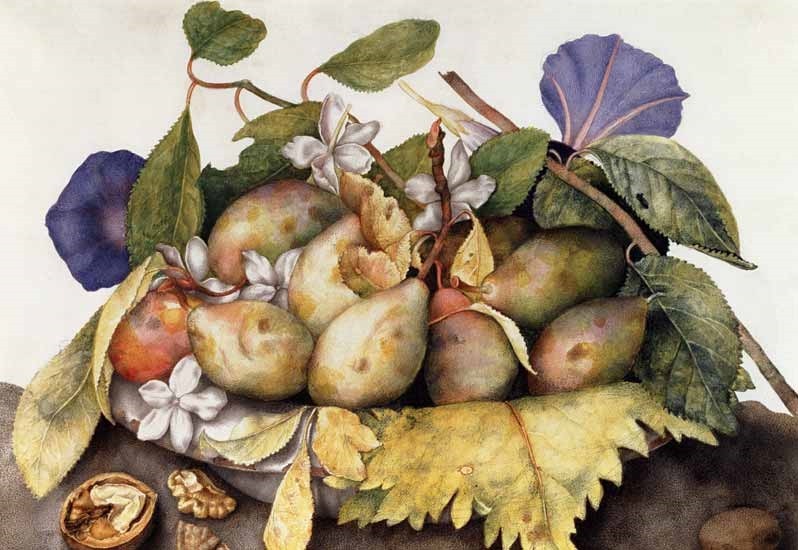 In my previous blog [19 April], I wanted to introduce Joseph Vernet more or less in the context of his time, as far as culture and ideas at least. So both ideas of the Sublime, and early Romanticism are part of the evolving visual culture during his career. It is the transition from the very orderly Baroque of Louis XIV’s long reign (1661-1715) to the more relaxed and pleasure-loving reign of Louis XV – the Rococo – and the emergence of Neoclassicism under the reign of Louis XVI (1774-1792). Joseph Vernet’s position during his active career escapes these generalizations. While he certainly embraced the increased emotion occurring in the visual arts during his life span, he seems to have struggled at times with the demands of his patrons and the integrity of his vision and ideals. But his work was well received and he was very well-known in his day. 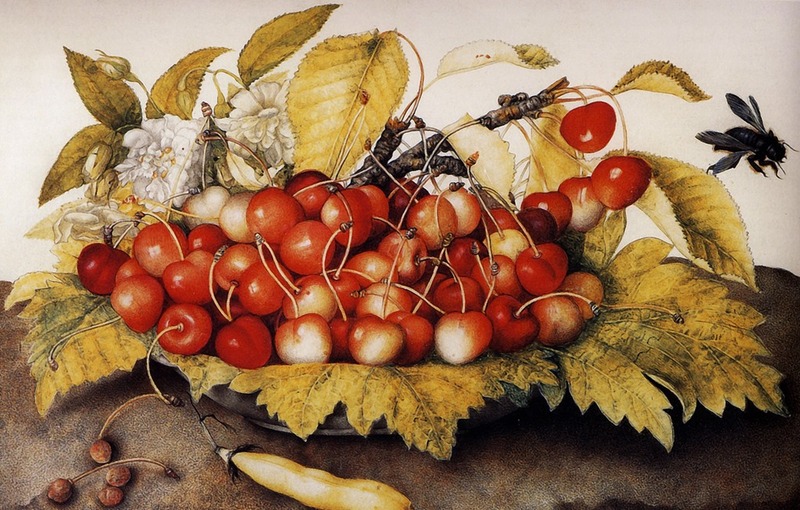 He should be better known today, because he was indeed a very fine painter. Elisabeth Vigée-Le Brun (1755-1842) Portrait of Joseph Vernet, 1778, oil on canvas, 92 x 72 cm, Musée du Louvre. 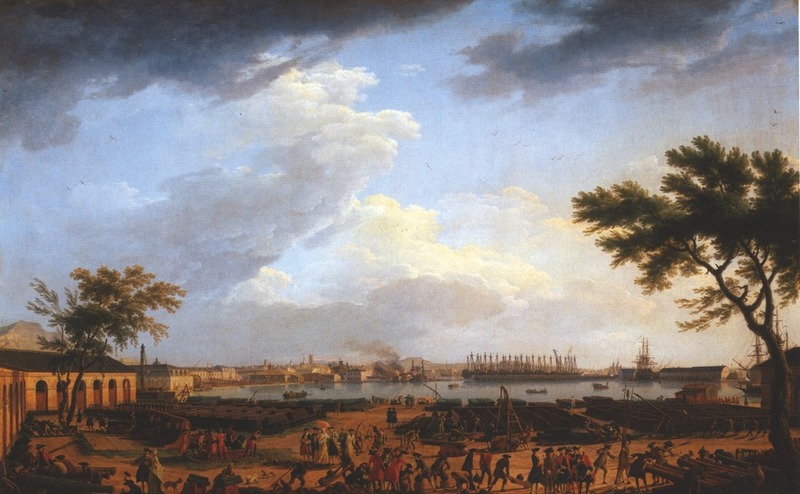 Shortly after he returned to France in 1753 from his long sojourn in Italy, through the Marquis de Marigny, the King’s Superintendent of Royal Buildings(in charge of all the royal buildings and their contents) he was given the commission to create 24 paintings showing the Ports of France. 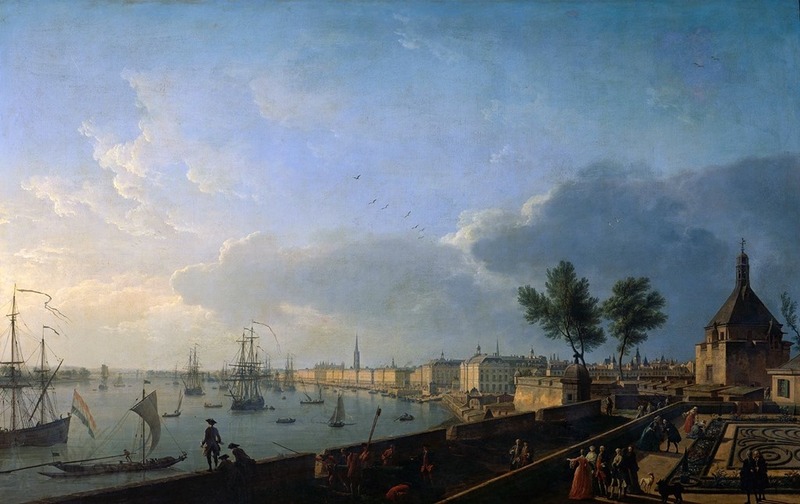 This commission would occupy him for about 12 years (1753-1765) during which he executed 15 large paintings for the King. The terms of the Commission specified that he would be paid 6000 livres, this sum covering any expenses and travel to be incurred in the execution of the commission. While the commission might have been very prestigious and fairly lucrative, he still had to find time to paint other works for other patrons so that, as he said, he could continue to feed his family. He worked on the commission until no more funds were available for him to continue. 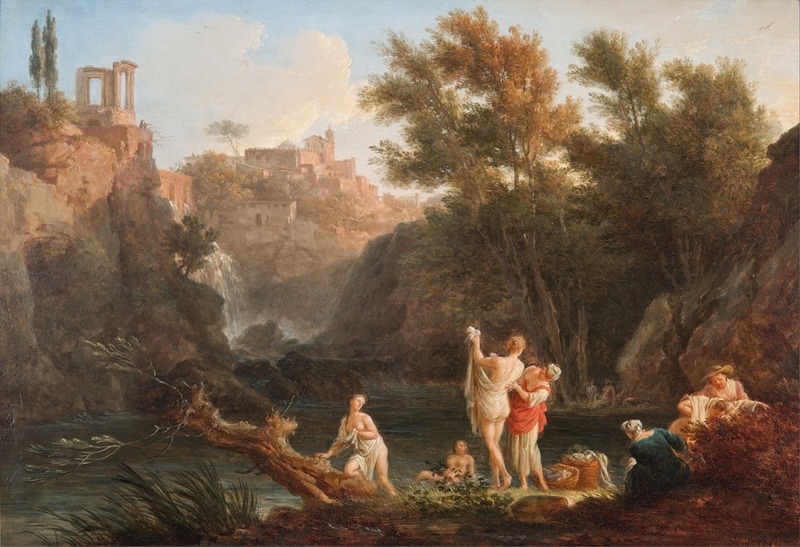 Because of the immense scope of the commission, one of most significant commissions in the 18th century, Vernet brought his family with him to the cities of Marseille, Toulon, Bayonne and Bordeaux where he established studios during the term of the commission. The expense of these moves must have been considerable, not to mention rather disruptive to his family life which meant a great deal to him. But the resulting 15 works he completed are really wonderful. I long to see the originals in Paris. It would be worth the trip if I could afford the luxury! While I have been to Paris a number of times, I never visited the Musée national de la Marine, and new nothing then of Joseph Vernet. The port paintings are in two groups. 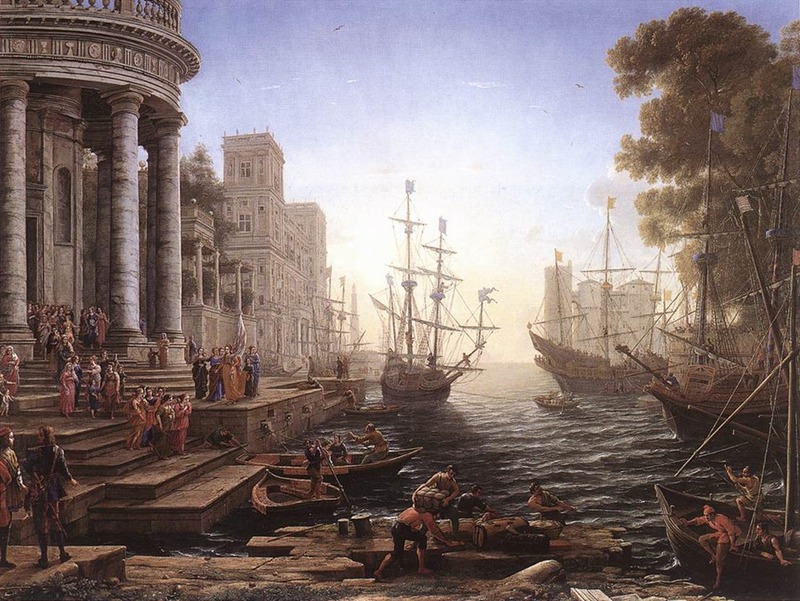 The first group consists of the ports on the Mediterranean (1754-57). 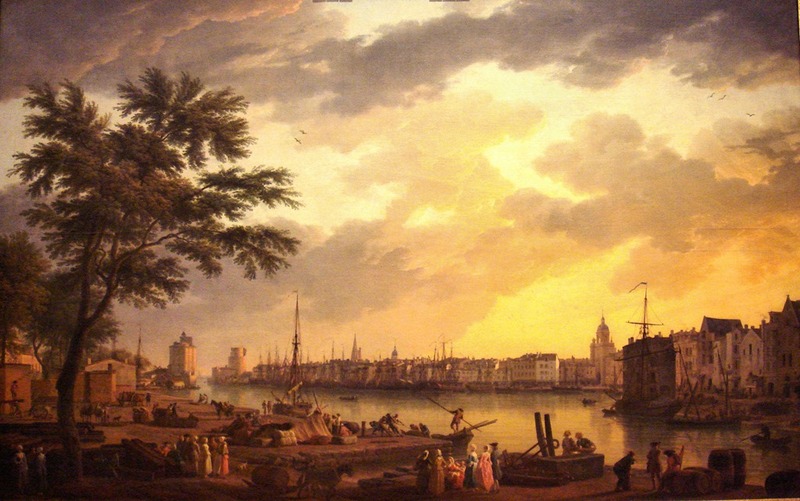 The second consists of the ports on the Atlantic coast (1757-1765). This blog instalment will deal with the Mediterranean ports. 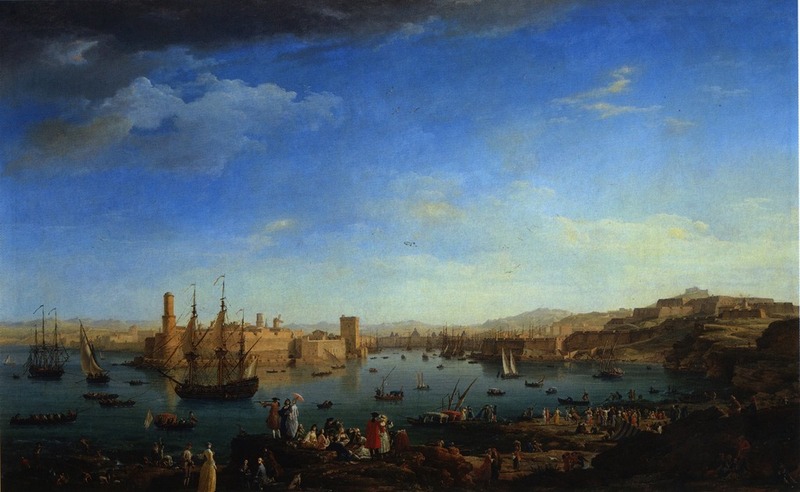 The two paintings of the port of Marseille were the first to be completed. 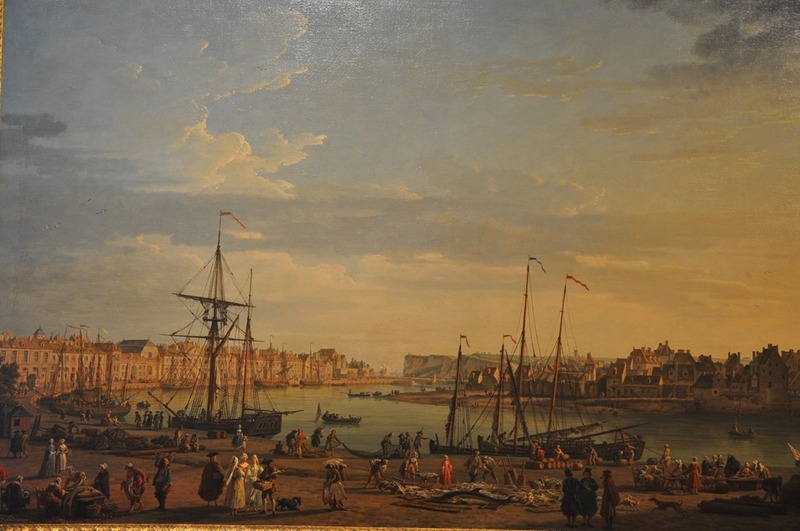 Vernet had first settled in Marseille in 1753 after his long stay in Italy, so he was in the right place to begin his series of port paintings. 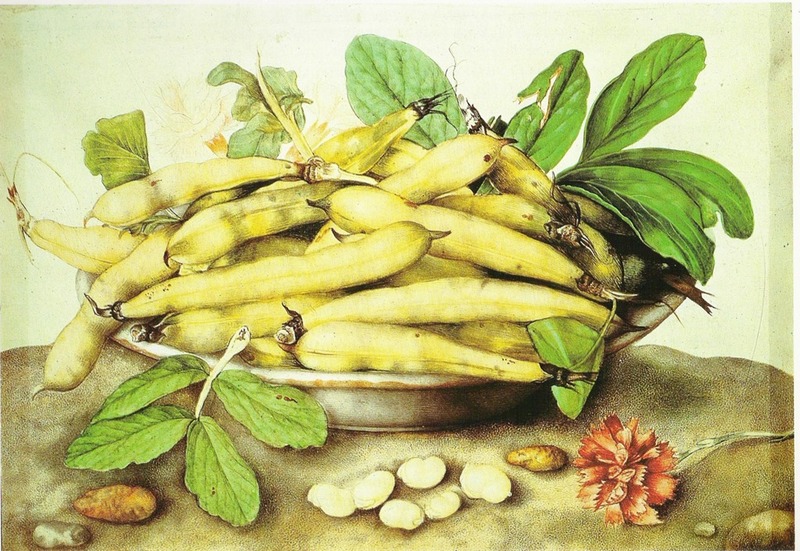 The first three paintings were executed in time to be exhibited at the Salon of 1755 in Paris. While the official instructions for these works suggested that the paintings should show the “considerable quantity of commercial buildings of all kinds, as well as all the nations that can continually be seen there,” Vernet delivers more than that. 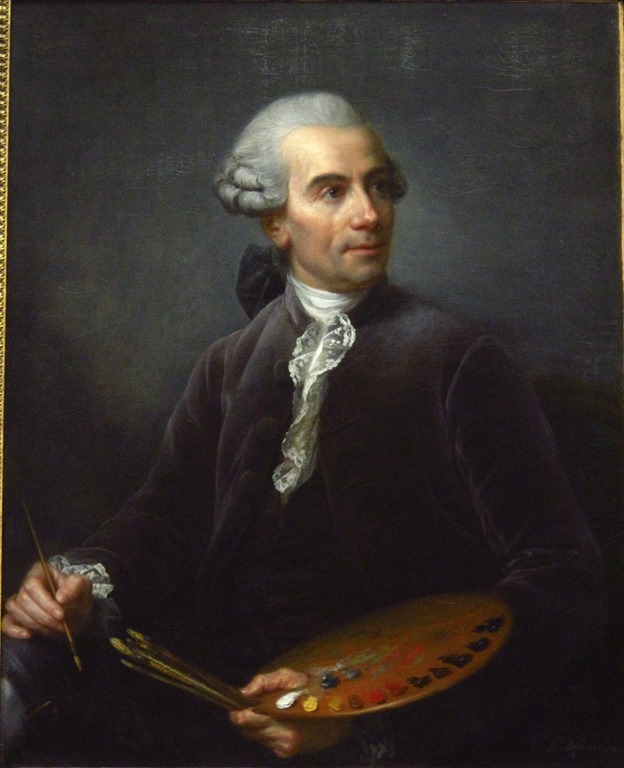 While he was working on the two Marseille canvases, he travelled a number of times to Bandol (a small port between Marseille and Toulon) and started the necessary sketches and studies for that canvas which he soon had underway. 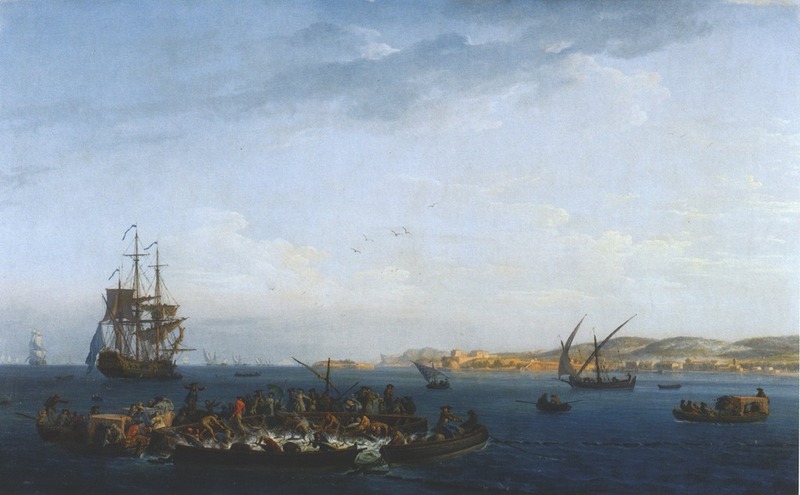 He lived in the castle overlooking the port, as had been suggested by the official instructions, suggesting “distinctive subjects characteristic of this location on the coast of Provence, one of which could be the tuna fishery, including its fixed nets (madrague)” suggesting the view from the castle. The work was well underway by January of 1754. 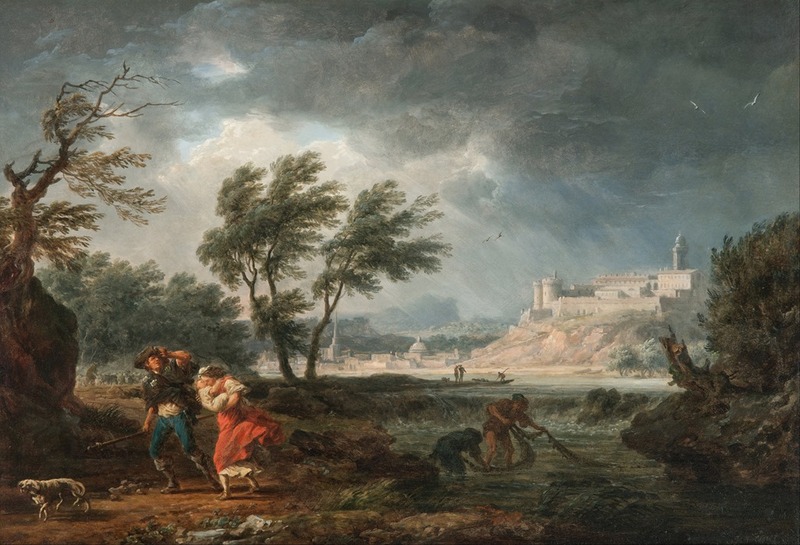 It was also shown at the Salon of 1755, along with the two Marseille canvases. 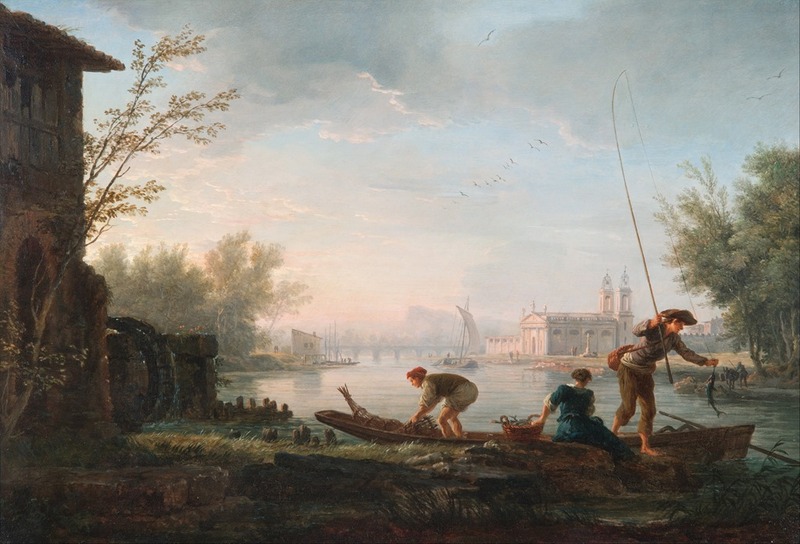 Throughout the Rococo period, contemporary critics valued the works of painters such as Vernet, Chardin and Greuze because of their sobriety. A work of art was expected to aspire to a higher moral purpose than the mere delight or titillation of the senses. In this case, the political purpose of the commission was to bring attention to the French navy and its commercial marine interests. This was especially important at a time when the French Navy suffered heavy losses during the Seven Years War with Britain (1756-1763). Reaction to these initial canvases at the Salon of 1755 was very favourable. One critic, Delaport, apparently lauded the example of Vernet and his depiction because it had the capacity to educate and inform the public, suggesting that such documents were far more useful than some of the frivolous (and useless) works of his contemporaries. 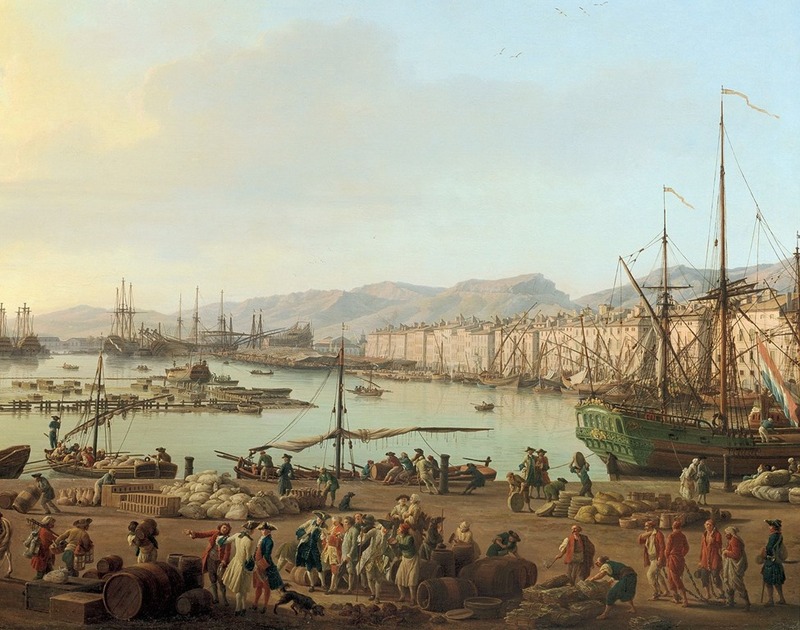 Vernet had moved his family to Toulon by the fall of 1754, and he soon started the series of three works showing different aspects of this most important port. He would stay in Toulon until the spring of 1756. 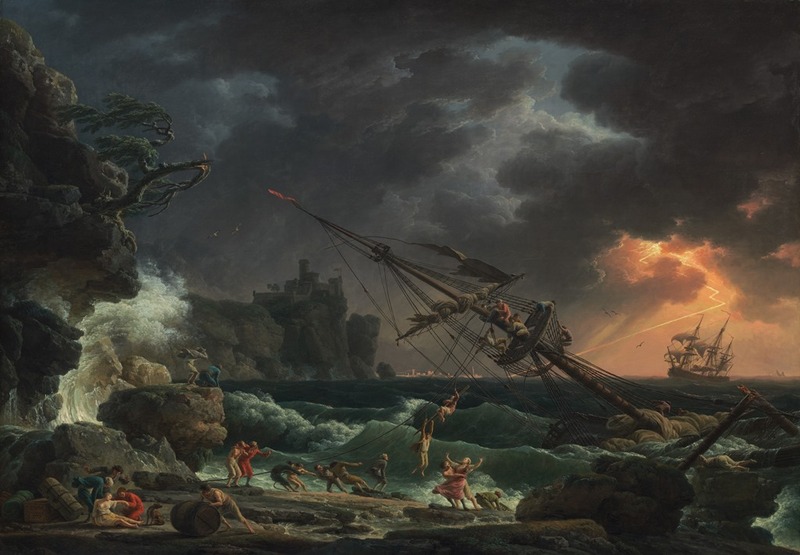 It had long been a military installation, and Vernet’s instructions were to document different aspects of the port, suggesting that at least three paintings could be created. It was suggested that the first could represent two docks, featuring the launching of a warship, and the tasks related to the equipping of a naval squadron. The second could show a squadron of twenty ships preparing to leave the harbour. 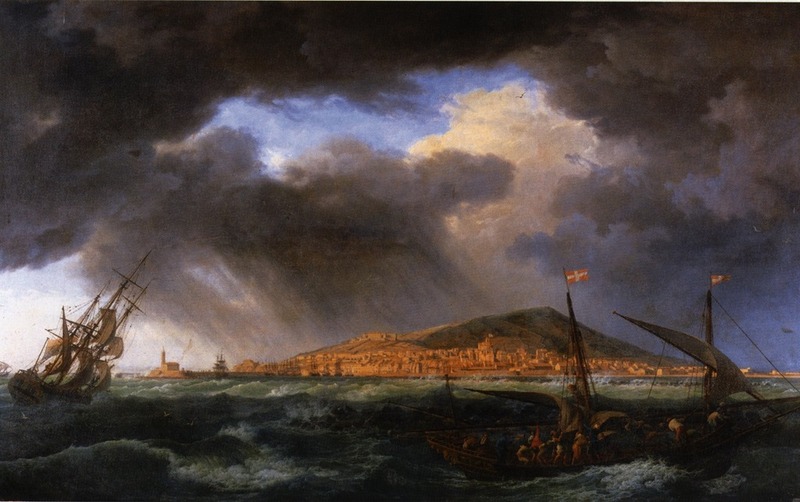 The third could represent the return of a squadron to the harbour in stormy weather. Such instructions were often authored by officials associated with the ports, and Vernet often complained about them to the Marquis de Marigny. 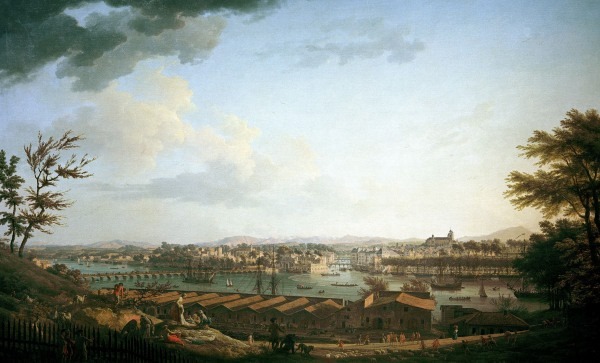 Joseph Vernet: Première vue de Toulon: vue du Port-Neuf, prise de l’angle du parc d’artillerie, 1755, oil on canvas, 165 x 263 cm, Musée national de la Marine, Paris. 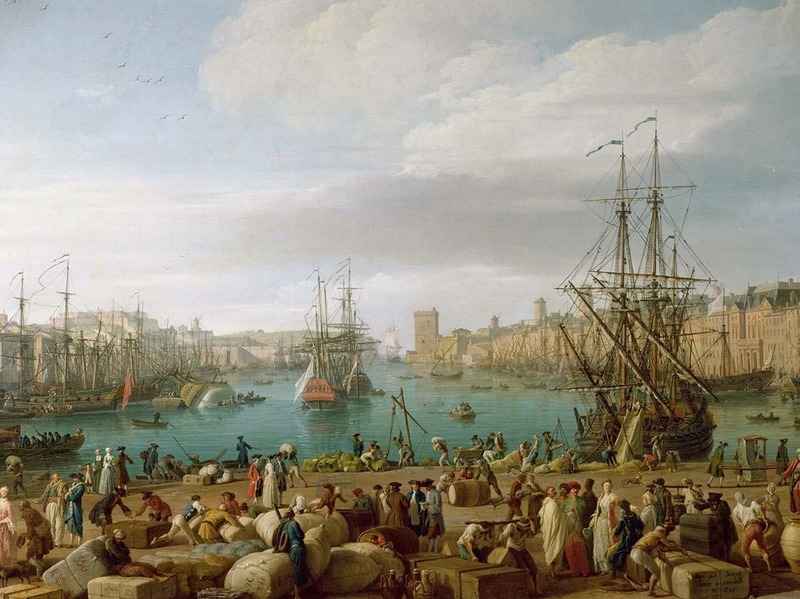 Also, shown at the Salon of 1757, Vernet described this view was follows: “The view is taken from the food warehouses and the foreground shows the provisions being taken aboard the King’s vessels. In the background can be seen a part of the Port Neuf. The time of day is at sunset.” The official suggestion of a squadron returning to the port in a storm had been disregarded completely. 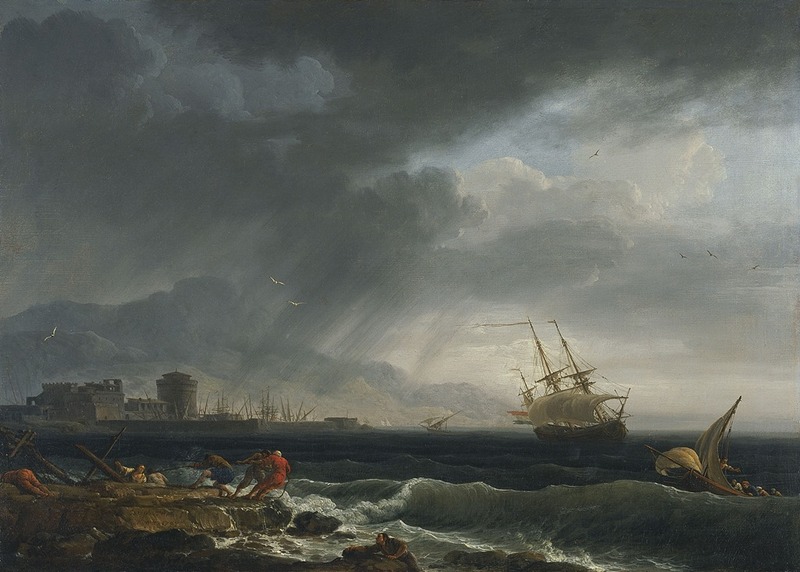 After the Toulon works were completed by April of 1756, Vernet travelled to Antibes alone to work on this particular work. 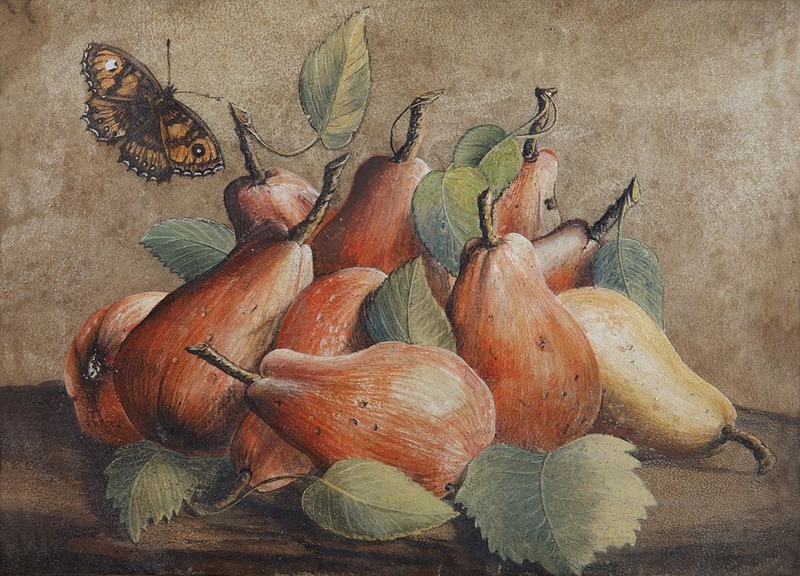 He undertook the usual sketches and preliminary work but did not complete the work until he had moved on to Sète, his family staying in Toulon. 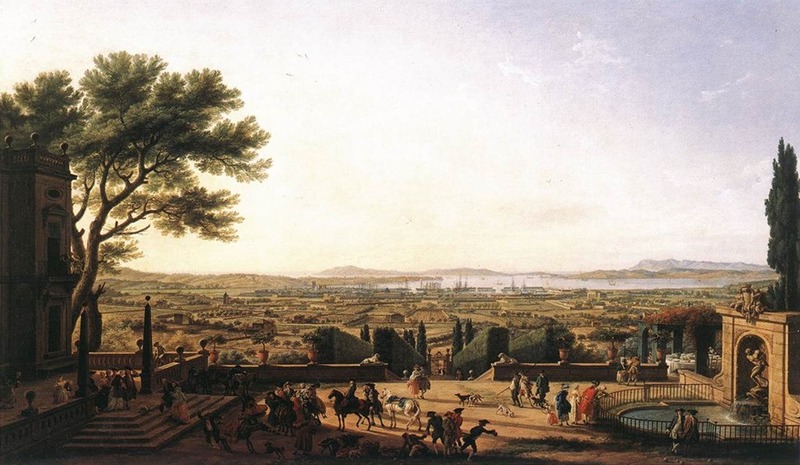 He was already working on the Sète canvas, but wrote that the Antibes work had been completed by January of 1757. 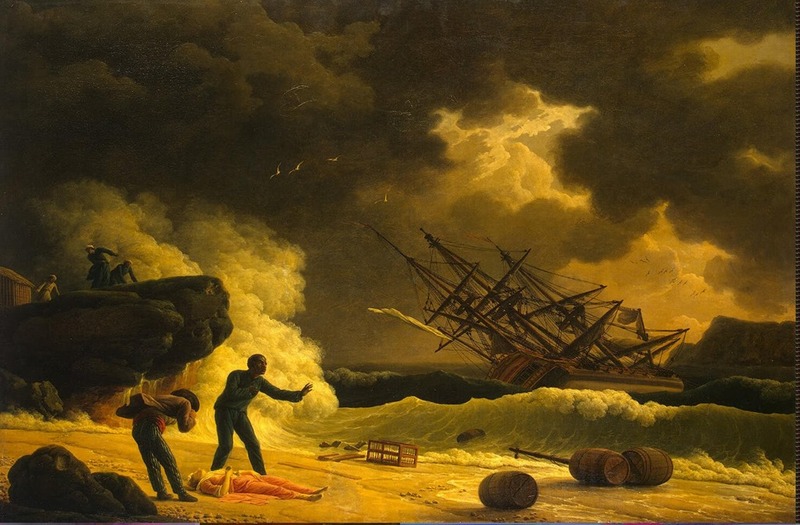 Vernet’s subject matter in Sète had been suggested by a Mr. Pelerin, a Navy official, and Vernet was unequivocal about his reaction. “He may well have a sound opinion on a number of things, but certainly not in the matter of producing a beautiful painting. 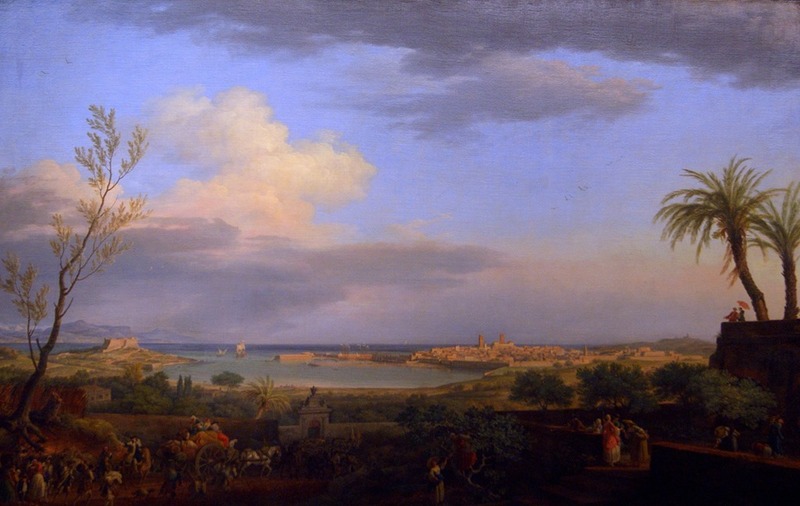 Most of the ports he has described in a similar fashion, and I did not follow the instructions, certainly not for the port of Antibes, and even less so here [in Sète].” The instructions apparently often described a panoramic description that would not have provided a good view. Vernet expressed his dislike of Sète in no uncertain terms. 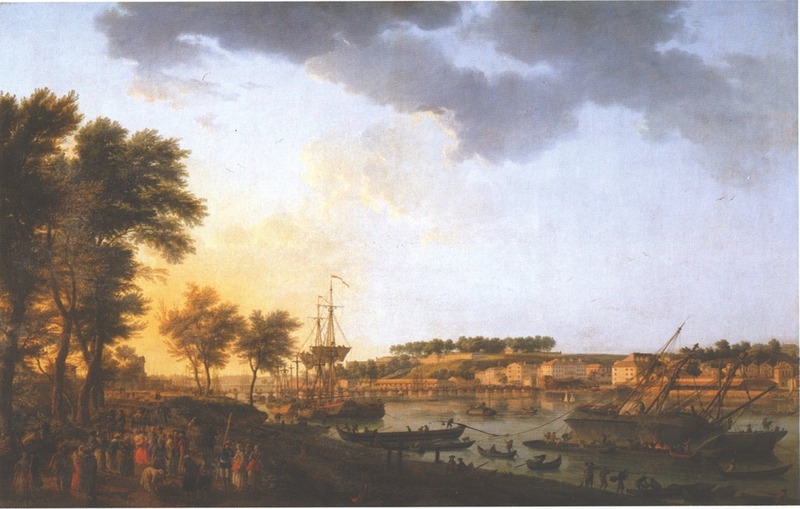 In a letter to the marquis de Marigny, dated 6th of Septmber, 1756,he wrote: “It would be useless for me to set up residence in this miserable town, where I would not be comfortable for painting, and if I see that living there would not be necessary, I could probably paint the picture in Bordeaux.” Marigny, however, thought otherwise: “I must bring to your attention that the King is paying for these paintings and that he expects you to bring to them all the perfection you can muster, and that they would be best completed on location. Thus, I expect you to finish your painting of the port of Cette at Cette and nowhere else.” Does the stormy scene reflect Vernet’s sentiments? It is the only port shown in a storm of the entire series. 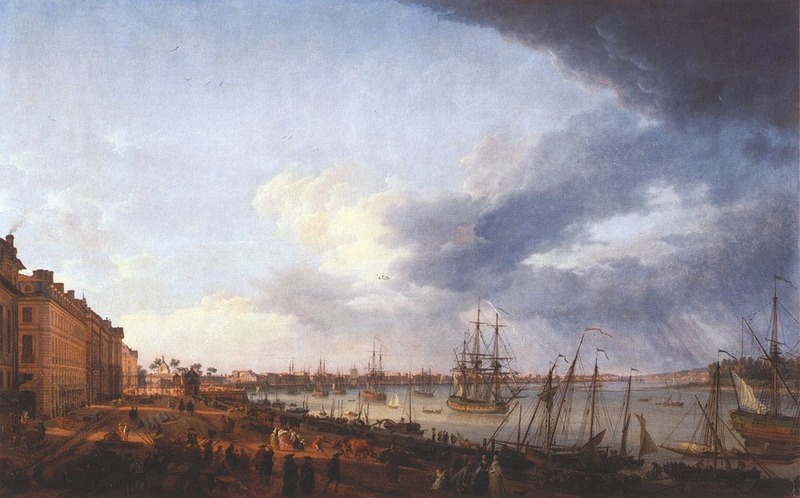 Joseph Vernet: Vue du port de Cette [sic], 1756-57, oil on canvas, 165 x 263 cm, Musée national de la Marine, Paris. Vernet’s process in creating these large paintings was that of making many preliminary small sketches and studies, and then setting to work on the large canvas more or less directly, without a preliminary sketch on the same scale. 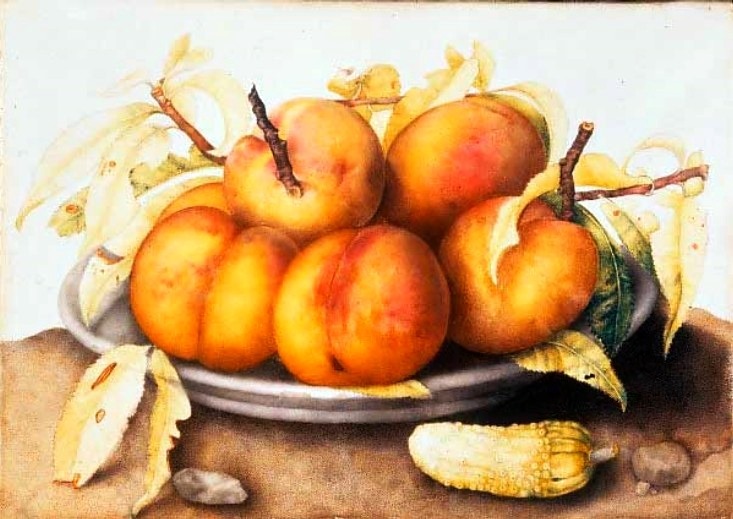 As he later wrote to a potential patron in 1765, “My method of working consists of composing on the canvas what has to be done and to start painting as soon as I can to take advantage of the heat of my imagination.” He wanted to preserve the freshness of the sketch in the large work. He thought that the work would be cold otherwise, and he was quite adamant that he be left free if he was to provide his best work, beyond the general subject of the work, such as a landscape, or seascape, a moonlit scene, a sunset, etc. As for the task of sending his work to the Salon, he would roll the paintings up and ship them, where they could be unrolled and put onto a stretcher and suitably framed in Paris. He requested that they should not be kept rolled for too long, nor be subject to excessive travel to avoid any damage. He also preferred a more classical frame to one with a lot of baroque ornamentation, featuring a cartouche containing in few words what the painting was about, and even suggesting that such straight forms would no doubt remain in fashion for a longer period of time. The primary source for this series of essays is from the website of the Musée national de la Marine, Paris. 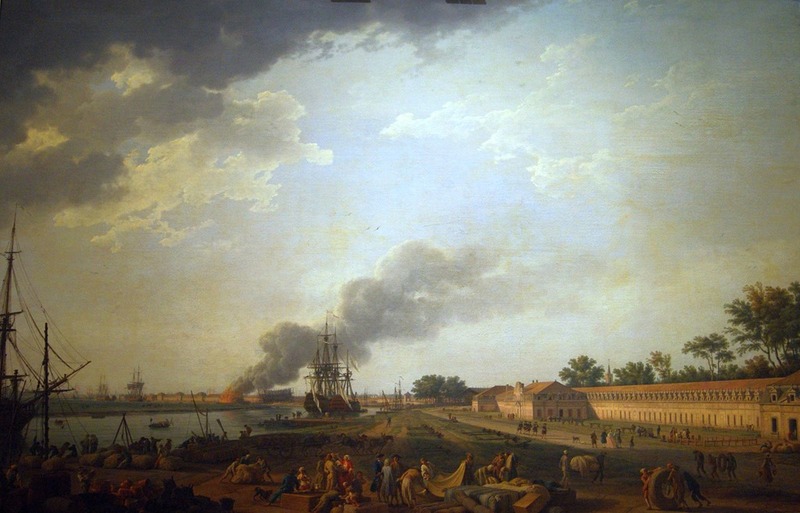 This features a virtual exhibition (in French only) on Vernet’s commission to paint the ports of France, and this has provided most of the information on this series of wonderful works, apart from the work cited below. The translations are my own. Tempus fugit! 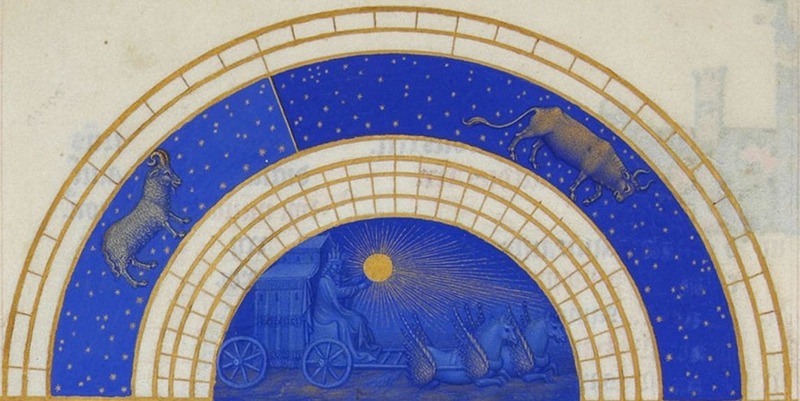 Time flies by and I see I am a bit behind in sharing the wonderful late medieval illuminations from The Très Riches Heures and the Belles Heures of Jean, Duc de Berry. 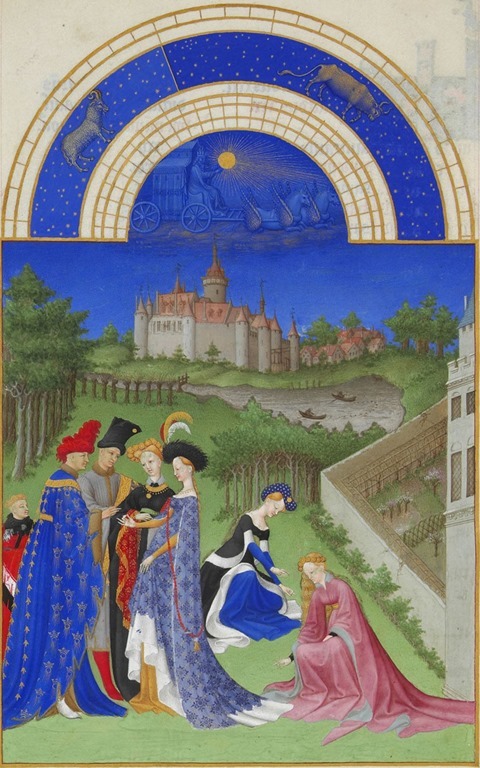 I’ll follow the format of my previous post of Wednesday, 11 February and present the illustrations for both months – March and April – from these marvellous manuscripts, executed for the most part, by the Limbourg Brothers. 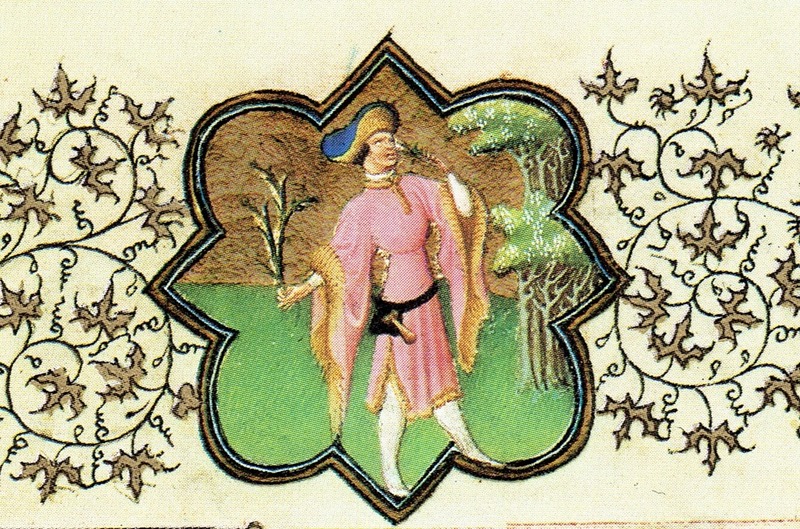 This is the representation of the month of March from the Très Riches Heures. It is a time for tilling the soil, pruning the vineyard and the general preparation of the fields as warmth slowly returns to the earth. 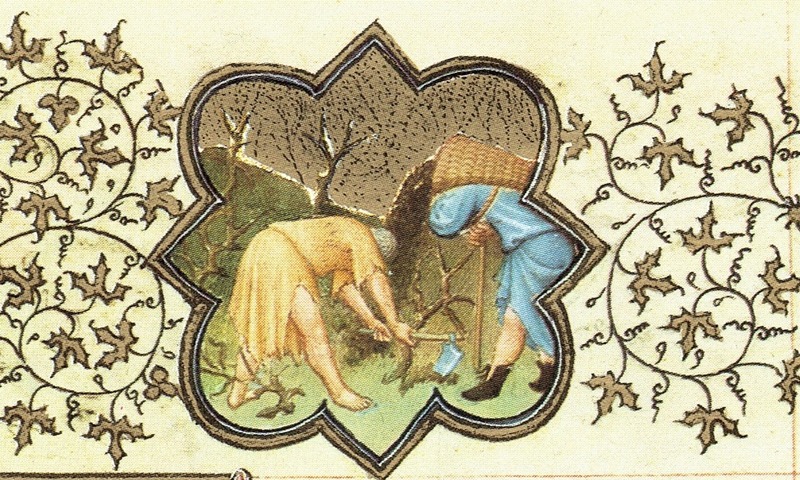 Serfs and peasants work on the vast estates of the Duke, and the castle featured here is that of Lusignan. 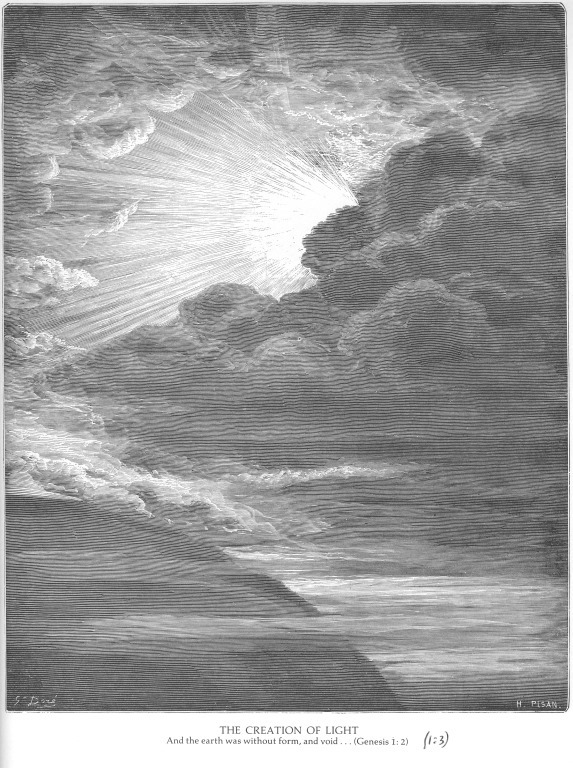 The picture is topped by the depiction of the Sun’s Chariot as it courses through the heavens, moving from the constellation of Pisces into that of Aries. 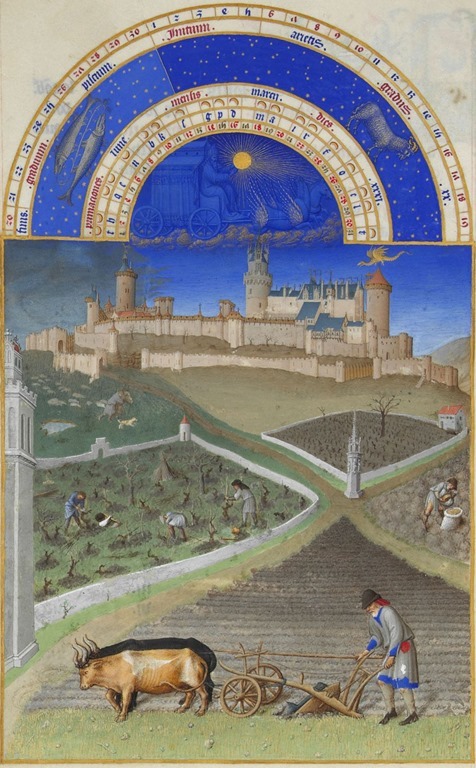 The other manuscript, that of the Belles Heures, provides a different approach, identifying some of the more important commemorations of the month. (The feast day of the Annunciation occurs on March 25, for instance. See below). The top quatrefoil contains a charming scene where one man hoes the soil, while another tips a basket of manure onto the still dormant plant. 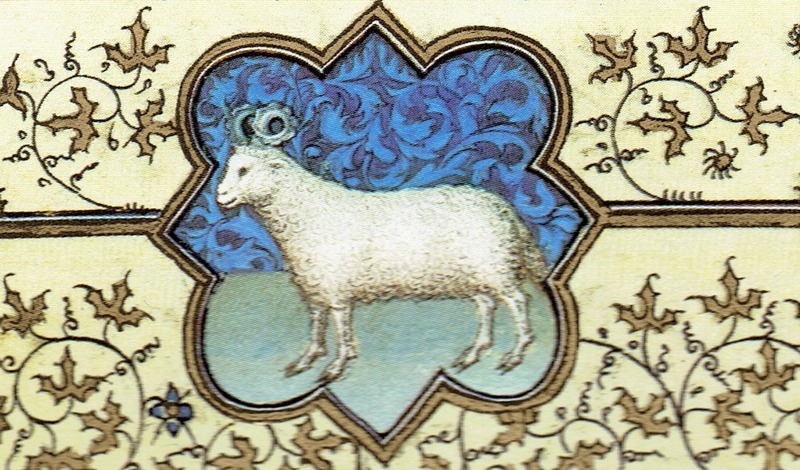 The Zodiac sign for Aries appears in the bottom quatrefoil as a white long-tailed ram. The month has long been associated with spring flowers. 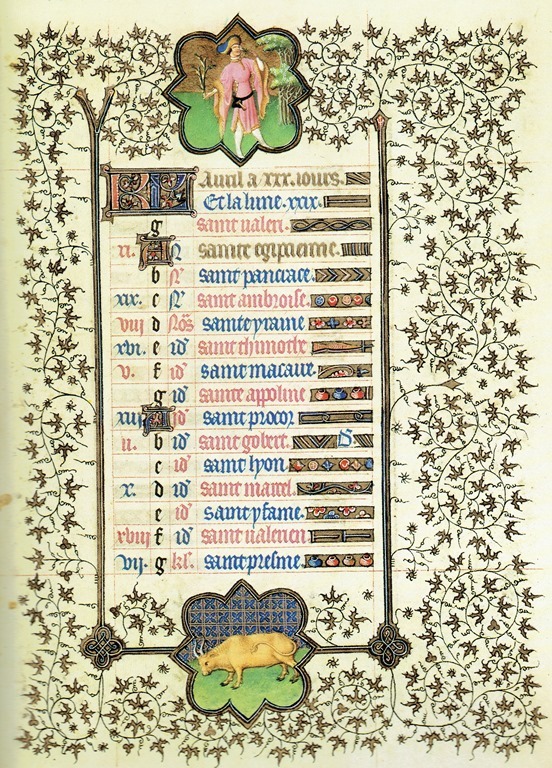 April is the first full bloom of spring, and the page from the Très Riches Heures alludes to this. The scene is now in the vicinity of the castle of Dourdan not too distant from Paris. Finely dressed ladies gather flowers, while a couple exchanges rings. The happy couple here is apparently Charles d’Orléans and Jean de Berry’s grand-daughter, Bonne d’Armagnac. It is the age of high chivalry. An enclosed garden to the right shows some trees in blossom. And the sun now travels from Aries into Taurus. 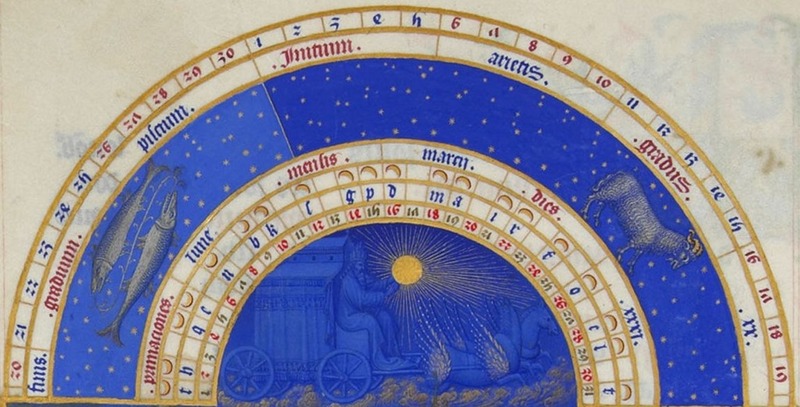 The Belles Heures, meanwhile, provides additional information. Beyond the various festivals celebrating the saints, Easter and Holy Week, occurring sometime in late March or April, depending on the moon, so do not appear on the fixed calendar. The upper quatrefoil shows a well-dressed gentleman carrying a green branch while he smells a blossom from the fruit trees to the right. 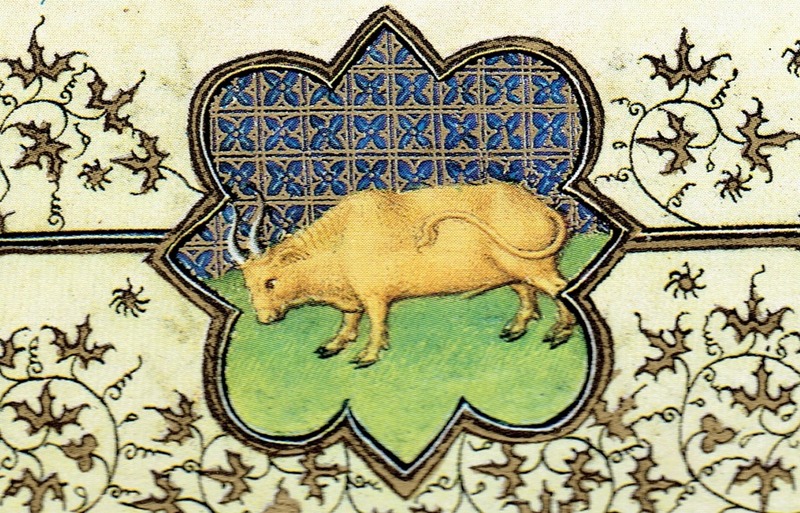 The lower quatrefoil shows Taurus, the bull, as the month’s zodiac sign. 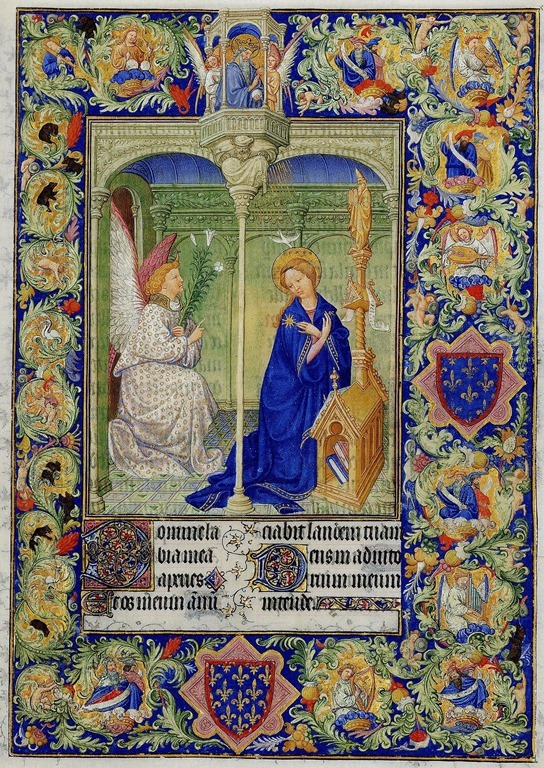 There is also a wonderful illumination showing the Annunciation, and I can’t resist showing it here, if only to demonstrate how splendid these illuminated paintings can be. 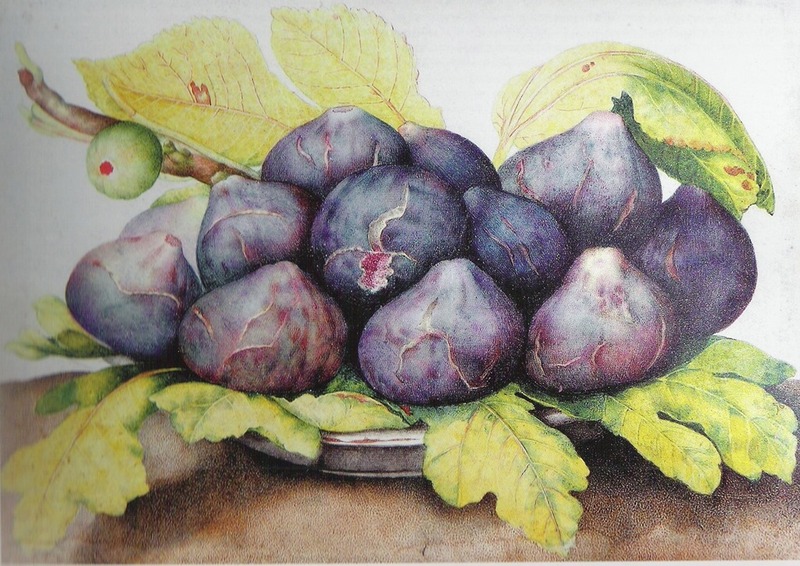 This is the art of Paul de Limbourg, ca. 1409-14. 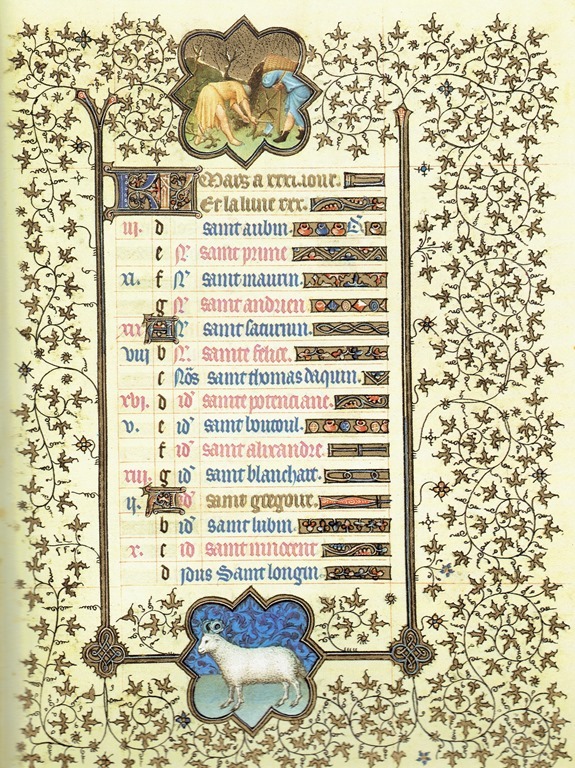 It is from the Belles Heures manuscript in the collection of the Cloisters Museum in New York. In 1974, the Metropolitan Museum of Art published a magnificent reproduction of this book through George Braziller of New York. I am so glad I purchased this years ago on a whim, and it is a real joy to rediscover it. Thames and Hudson reprinted it in 1975 and it is still available on amazon.com. The solemn festivities of Holy Week are the source of a long iconographical tradition. Some of the best known images inspired by the events of that week are universally known, and repeated to the point of cliché, which is regrettable because it somehow diminishes the power of the original works. 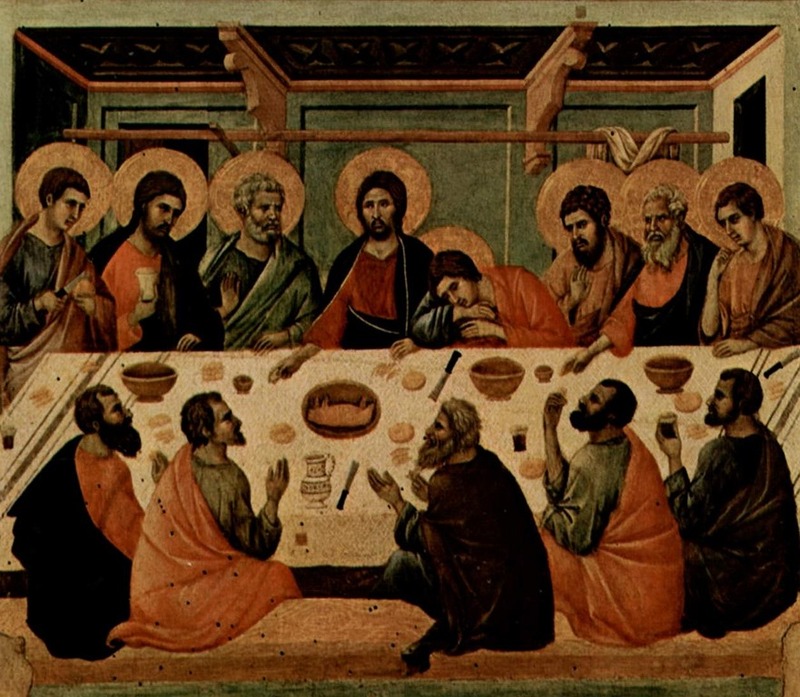 There are two main events that occur on Maundy Thursday or Holy Thursday, the Last Supper, and the Mount of Olives vigil. Both have had their share of visual representations, but the Last Supper is no doubt the most widely represented. 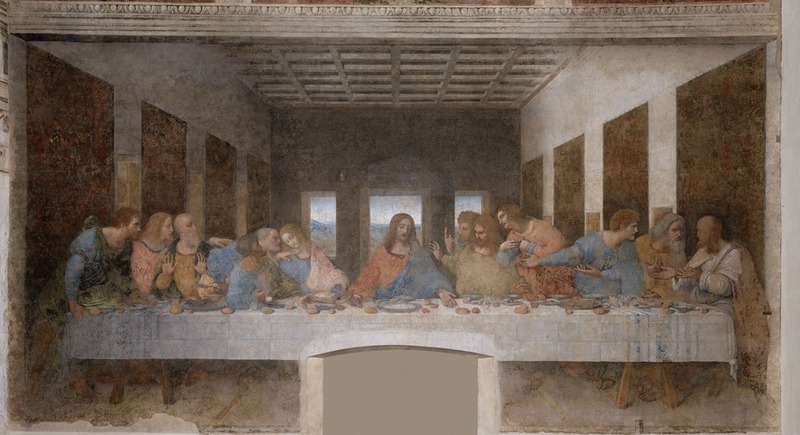 Of course, the best known representation of the Last Supper is that of Leonardo da Vinci. I have never seen the original as the monastery in Milan that houses it was closed when I visited the city in the spring of 1971. Perhaps it is just as well, as it was in a lamentable state at the time, and has fairly recently been carefully restored as best as can be without compromising the integrity of Leonardo’s original, or what’s left of it. Here is (I think) a fairly recent picture of the masterpiece. which is to be found in the refectory (dining hall) of the Dominican Convent of Santa Maria delle Grazie in Milan. The work was painted between 1494 and 1498 and measures 460 x 880 cm or about 15 feet high by almost 29 feet, and is situated on a high wall above a doorway. If ever there was a picture that illustrated the dynamism and drama of the Baroque period, this is it. I often used it in my lectures to show the difference between the Renaissance (da Vinci) and the Baroque aesthetic. 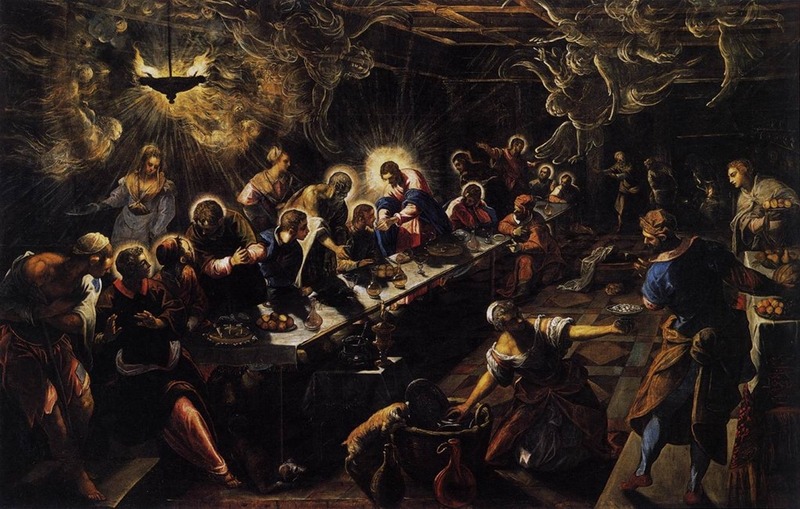 The Tintoretto is probably my favourite depiction of the Last Supper. It is an oil on canvas and measures 365 x 568 cm (about 12 by 18 feet) and dates from about 1592-94. I can imagine the impact this depiction of the Last Supper would have had on people still accustomed to Late Medieval and Renaissance traditions! 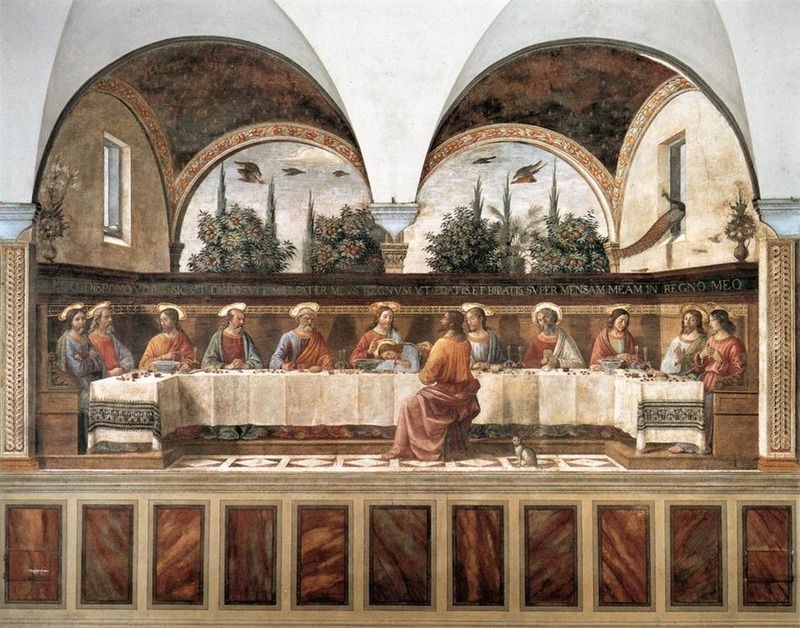 There is also a wonderful depiction of the Last Supper by Domenico Guirlandaio (1449-1494) dated 1480, so it predates Leonardo’s by a decade or so. 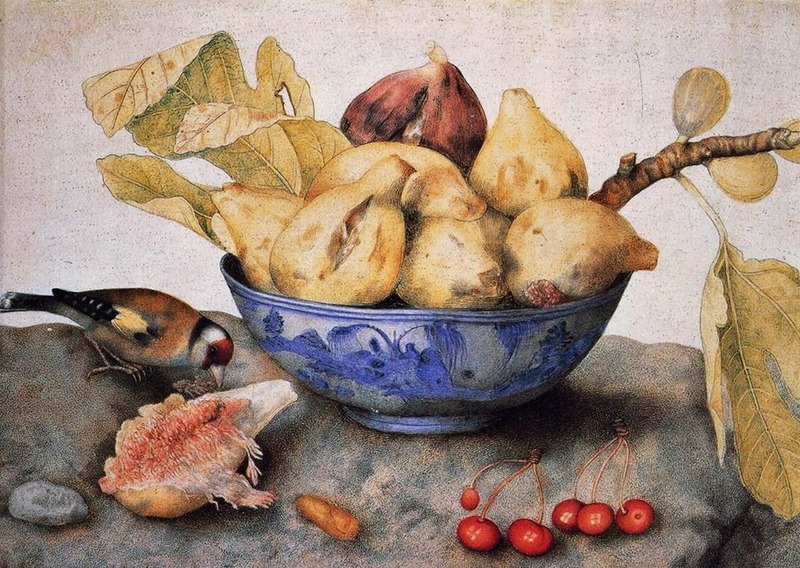 It is a fresco in the Cenacolo di Ognisanti In Florence. It measures 400 cm × 810 cm (160 in × 320 in). 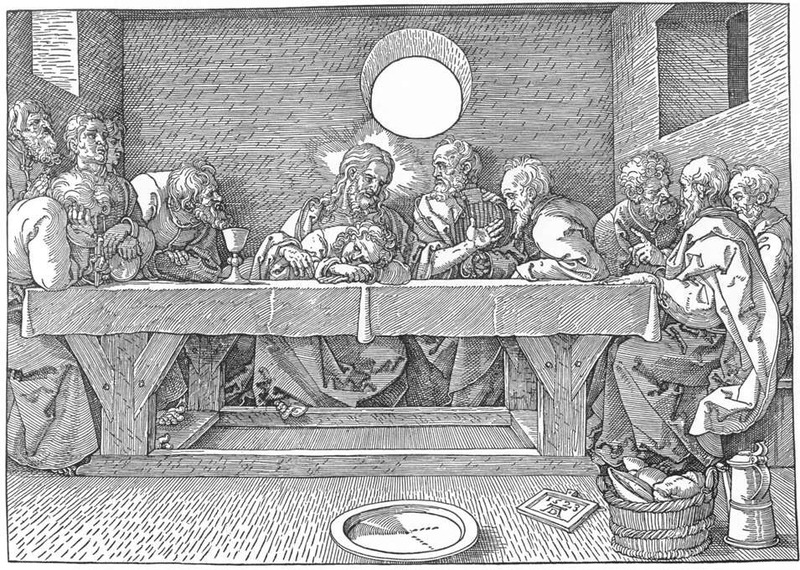 Artists have generally focused on one particular moment during the Last Supper. Leonardo focused on the moment when Christ says that one of the disciples will betray him. Others have focused on the breaking of the bread and the communion-related aspects of the event, the new covenant, etc. Still others have taken a less specific moment. 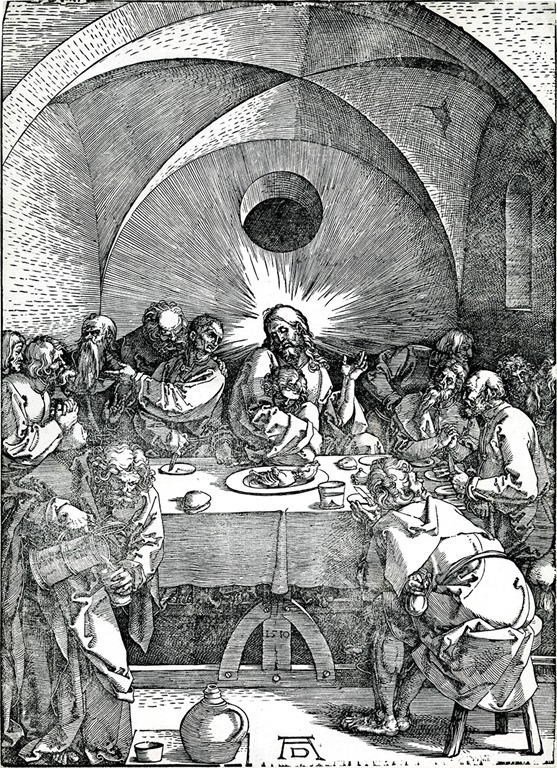 Albrecht Dürer (1471-1528) for instance emphasized the Eucharistic moment in his 1523 woodcut, shown here. We have some leftover Passover lamb on a platter, with bread on the table and wine being poured. In both instances, as in the Guirlandaio depiction above, St. John is in Christ’s arms, or resting on his breast, as stated in John’s Gospel: (John 13:23) “Now there was leaning on Jesus’ bosom one of his disciples, whom Jesus loved.” (King James version). John was the youngest of Christ’s disciples, and was an early recruit, along with his elder brother James, sons of Zebedee, fishermen on the Sea of Galilee. When I first visited Italy in 1971, I spent most of my time in churches and museums, looking at art first hand. As I had a good knowledge of scripture back then, and Christian iconography in general terms, depictions of the scenes inspired by the Gospels were familiar to me. What was less familiar was some of the earlier iconography, some of it quite literal, which makes for rather awkward pictorial situations. 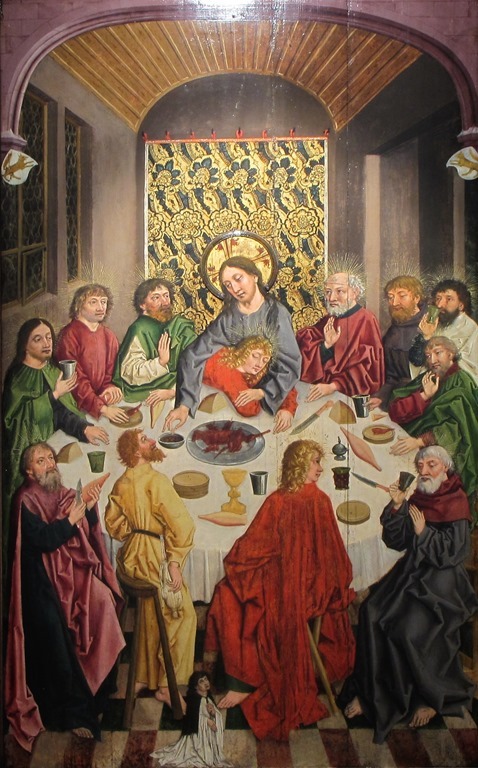 How are we to understand these depictions of St. John “leaning on Jesus’ bosom?” There is greater clarity in the depictions of Judas, of course, who sometimes sits alone opposite Christ across the table. One extraordinary depiction of the Last Supper, by one Heinrich Lutzelmann (ca. 1450- ca. 1506) was done in 1485 on a panel and is situated in the Church of St. Pierre-le-Vieux in Strasbourg (Alsace). It is about 203 cm high. Once again St. John is seen in Christ’s arms, asleep or just resting. Traditionally, the Apostles were represented with haloes, and this sometimes posed a bit of a problem. Giotto (ca. 1265–1337) in his 1305 depiction demonstrates how awkward this can be when the figures seen from the back or the side appear to have their heads on some kind of platter that has discoloured over time. 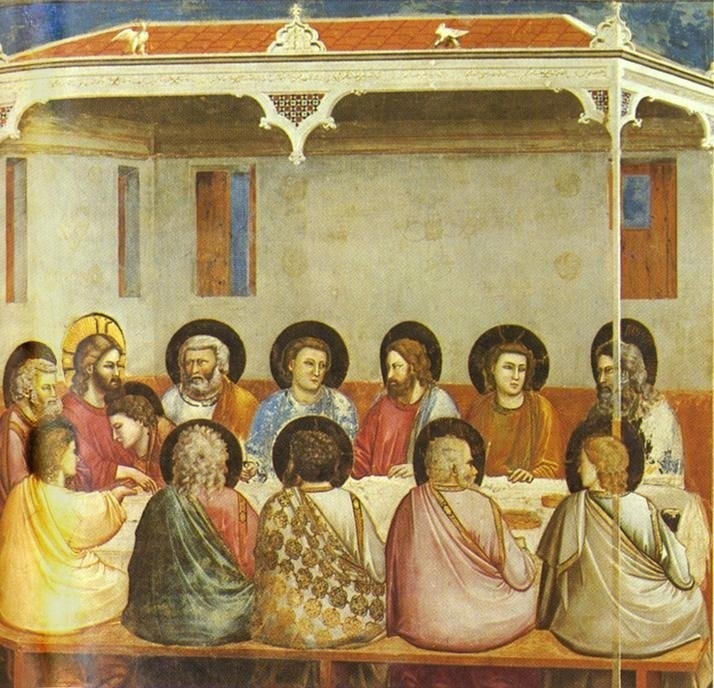 Then there is the wonderful depiction of the Last Supper by Duccio di Buoninsegna (1235-1319) dated 1308-1312. Duccio avoids the problem of the haloes by only placing them behind frontal figures. There is lots of discussion and scholarly debate over whether or not the Last Supper was a Seder (the traditional Passover meal) or not… the question being exactly on what day of the week did the Last Supper occur? There seems to be some consensus that it was not a Seder, since the meal occurred at least one day before the Crucifixion which was on a Friday (before Sabbath). So the menu served up at the Last Supper is an open question. What was certainly served was bread and wine, and the occasion was a gathering of friends. The farewell sermon of Christ to his disciples on this occasion still makes for extraordinary reading today, regardless of one’s personal beliefs. The Gospel of St. John, originally written in Greek, is the most poetic of them all, as is his book of Revelations. All images readily available online.